The book called Gumbo Tales... Finding My Place at the New Orleans Table by Sara Roahen. Check out "I'm a NOLA GIRL" this week for a give away. Who wouldn't love a book where the main characters are food, New Orleans, and the people who define both. 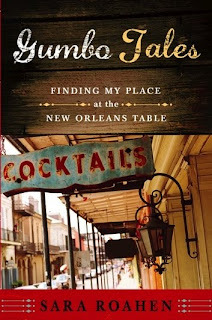 In each chapter, whose titles bear the names of some of New Orleans most famous culinary signatures, Sara beautifully describes the relationship between the people of New Orleans and the food that makes it famous. Food that storied cannot be born of anything but love, and she perfectly captures the passion that New Orleanians have for their home, their cooking, and the good folks they share these things with. here is keeping my fingers crossed, I win.. if not I am going to have to order this book.